This is a list of movies of all of Ronald Reagan's most prominent onscreen acting roles as well as narrating roles. Also, included in this list are some of Reagan's special cameo appearances. He retired from acting so that he can be active in politics. He was elected Governor of California and soon President of the United States. ↑ Stephanie Thames. "Jean Negulesco Shorts". Turner Entertainment Networks. Retrieved June 20, 2012. ↑ 2.0 2.1 Helfer, Andrew (author), Steve Buccatello (artist), and Joe Station (artist). Ronald Reagan: A Graphic Biography. Hill and Wang. 25. ↑ "Target Tokyo." Victory in the Pacific. PBS. Accessed October 9, 2008. 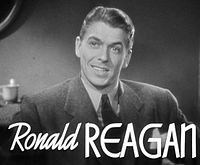 Wikimedia Commons has media related to Ronald Reagan filmography. General Electric Theatre "The Dark, Dark Hours", rare 1954 video starring Ronald Reagan and James Dean. Edited to 6 minutes in length. "Ronald Reagan on TV" by Billy Ingram, at TVParty.com. This page was last changed on 14 June 2018, at 00:27.